While calmly lying on a specially designed table, Sancho the Texas Longhorn gets a foot a trim. Where do mini pigs go when they need a doctor? 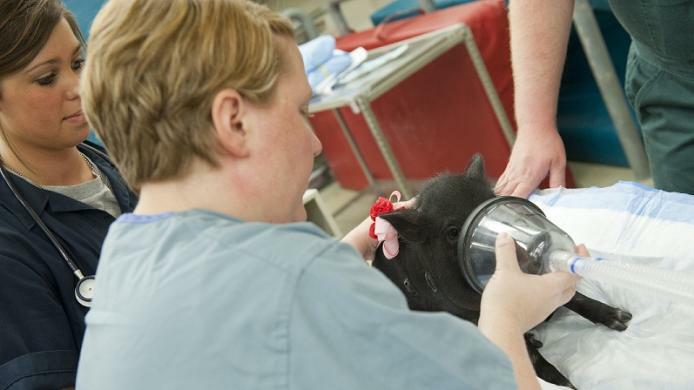 Ohio State's Hospital for Farm Animals at the Veterinary Medical Center is happy to care for your pet mini pig. We treat pigs of all shapes and sizes! Brutus Buckeye got a taste of what it's like to care for farm animals and, with the help of Dr. Andy Niehaus, viewing a live surgery!